Yes, I am fully aware that my HTML and CSS skills are lacking, and that my table below could be a lot cleaner. I’m working on this. However, with all the excitement surrounding Johnny Manziel (Texas A&M, QB) and his Heisman campaign, I thought of some stats that would be interesting to look at. The table below essentially compares two things. 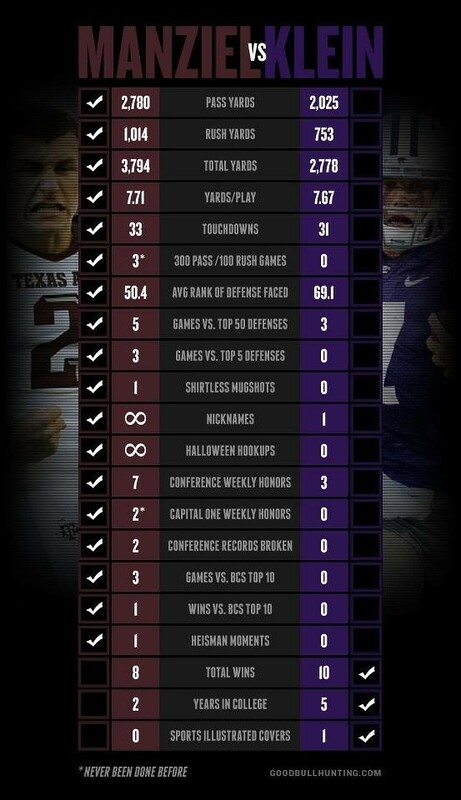 It compares the 2012 stats of Johnny Manziel against those of Collin Klein (Kansas State, QB). Why Collin Klein? Because he, along with Manziel, is considered one of the top two players with a realistic opportunity to win the Heisman Trophy. The table below also compares Manziel’s (and Klein’s) stats against the last 10 Heisman winners. The stats for the Heisman winners are from the season in which they actually won the award. *Note: As of today’s date (Nov. 16, 2012) Manziel and Klein have only played 10 games this season and have at least two more before the Heisman is to be awarded. The stats for the 10 Heisman winners are for complete seasons of 12, 13, or 14 games. You can find other comparisons (statistical and otherwise) between Manziel and Klein at ESPN.com’s Heisman Watch. For more on Johnny Manziel, check out his Heisman campaign page. Still not convinced? Check out what Clay Travis had to say about Manziel and the Heisman at OutKickTheCoverage.com. Finally, the following graphic was made by the guys over at GoodBullHunting.com. They did an excellent job putting this together. However, while I have the same stats for Manziel (in my table above) as they have on their graphic below, our stats on Klein seem to differ. Notice the stats that are fifth and sixth from the bottom titled “Games vs. BCS Top 10” and “Wins vs. BCS Top 10.” Manziel has had three games against the BCS Top 10 and won one of them. On the other hand, Klein has yet to play against any team in the BCS Top 10. This isn’t football for me, it’s a kind of rugby, I don’t understand these sports, but real football (Brittish English) I’d understand. I don’t speak American English! Fair enough! Thanks for stopping by and commenting on my blog (even if you do prefer a different brand of football). I actually played some rugby in college, so I am quite fond of that game as well. Well, now that Klein lost and had 3 ints, and Mariotti out of Oregon just lost, I wonder how that will help Manziel in the hunt? Would be sweet. Absolute travisty if Johnny doesn’t win!